The spotted wing drosophila is a pest of a broad range of fruits, including tree fruit, berry and vegetable fruit. Unlike other vinegar flies, spotted wing drosophila attacks healthy ripening fruit as well as damaged or split fruit. The female will penetrate the skin of soft-skinned fruit with her ovipositor. One female can lay several hundred eggs in her llifetime. 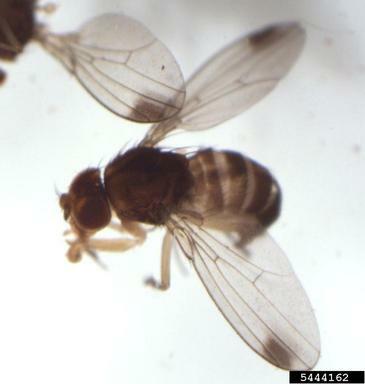 The spotted wing drosophila was not actively searched for as part of the CAPS surveys, but was reported to CAPS from individual growers. Positive identification was made by the University of Wyoming Extension Entomologist. To date, the spotted wing drosophila has been found in Fremont, Goshen, Laramie and Platte counties.